After you’ve finished your turkey-filled leftovers and traded your stretchy Thanksgiving pants for your favorite Christmas sweater, the holiday season has officially begun. To get into a festive mood, check out the handful of festive events around Atlanta to help you celebrate the joyous occasion. And don't miss the other cheerful shows around the city this holiday season, including Atlanta’s twinkling lights or spirited ice skating rinks. The Nissan Foundation and Fernbank Museum of Natural History have once again joined forces to bring Winter Wonderland back to Atlanta. See how families from Africa, the Caribbean, Europe, the Mediterranean, the Middle East, North America and South America deck their halls with the museum’s display of more than 30 Christmas trees—each have been decorated by consulate generals from countries spanning the globe. On select days before Christmas, you’ll find family-friendly activities like holiday flicks, cultural crafts and performances, puppet crafts with the Center for Puppetry Arts, sneak peeks from Atlanta Ballet’s Nutcracker and the famed Santa-saurus. There will also be the Ugly Holiday Sweater Party on December 16, 2018 at 6-9 p.m. It will feature cookie decorating, seasonal arts and crafts, photo opps with the one-and-only Santasaurus, and more. Tickets include event admission and access to all indoor exhibits, including Winter Wonderland and Nature’s Superheroes: Life at the Limits. Cost: Free for Museum Members; $18 per adult ticket; $17 for students/seniors tickets; $16 for children ages 3 to 12; free for children ages 2 and younger. Westside Provisions’ annual holiday celebration is back, complete with complimentary hot chocolate and salted caramel corn from West Egg Café for your stroll through the trendy district. Expect a snow machine, carolers and retailers like JCT Kitchen & Bar and Cooks & Soldiers serving complimentary s’mores and other sweet treats alongside their goods. Don’t Miss Santa Claus—you can find him at Seed Factory for family photo-ops with complimentary prints. For more than 50 years, families have celebrated the holidays with a ride on Atlanta’s favorite vintage train: Priscilla, the Pink Pig makes her way through a life-sized storybook filled beneath the legendary 170-foot, 1950’s themed Pink Pig Tent. You may know the Indie Craft Experience (ICE) from their vintage and summer markets—founders Christy Petterson and Shannon Mulkey have built an empire on quarterly Southern-curated marketplaces. But this holiday season for the eighth year, ICE is hosting their Holiday Shopping Spectacular market at the oldest standing building in downtown Atlanta, complete with 175 vendors, DJ, festive cocktails, and local food trucks. There's another smaller holiday market also available on December 9, 2018 from 11 a.m. to 6 p.m. Midtown Atlanta will become Santa Claus Lane as the largest holiday parade in the southeast marches down Peachtree Street. Complete with floats, giant balloons, and marching bands, the parade is sponsored by and benefits Children’s Healthcare of Atlanta. Can’t make it? No worries—WSB-TV Channel 2 will broadcast the parade to an expected 500,000 viewers starting at 10:30 a.m. Location: Begins at Peachtree St. and 16th St., ends at Peachtree St. and 5th St. Cost: Free to stand, bleacher seats $18 per person. If you did not purchase a bleacher seat, it is suggested to arrive by 8:30 a.m.
Visit Oakland Cemetery and experience the holidays in Victorian style with a behind-the-scenes tour through the seasonally decorated mausoleums, open for exploration and led by a costumed docent. Guests can also make their very own Victorian ornament and get a photo with Ole Saint Nick, all the while enjoying hot chocolate and holiday carols. Don’t miss a sit-down reading of The Night Before Christmas or a 10 percent discount off of holiday items at the Visitor’s Center and Museum Shop. 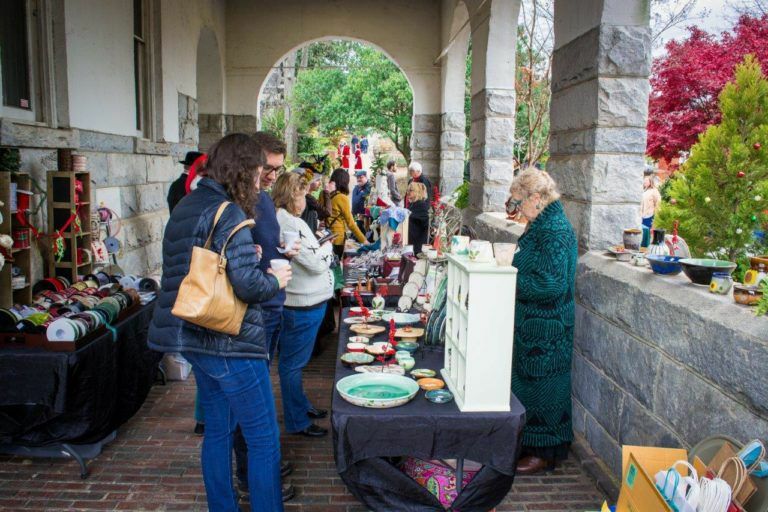 This is the Oakland Cemetery's fourth year running the Victorian Holiday event. Date: December 1, 2018 from 10 a.m. to 4 p.m.